Very nice location, excellent stay one night. good accommodation in apartment, facilities very good , spa and pool. Serenity, calm and relaxation reign supreme in our hotel situated in the heart of nature, just a stone's throw from the lake and the city centre. Our team awaits you, with a smile, to help you discover the many treasures that abound in our region. A rare harmony reigns in this contemporary and refined hotel. Here, the works of painter Jean-Michel Alberola unfold on large walls, like great colourful breaths that invite tranquillity and contemplation. Jean-Michel ALBEROLA is today one of the few French artists who has achieved recognition in France as well as on the international scene. He lives and works in Paris. His work which was applauded as soon as it was first exhibited at the ARC in 1981, is now to be found in many museums, institutions and collections throughout the world. He has exhibited in Dusseldorf, Haarlem, Brussels (At the Verrière Hermès in 2006), Helsinki and Berlin as well as in Paris at the Centre Georges Pompidou (1993) the Fondation Cartier (1995) and the Musée d'Art Moderne (1997). He is represented by the Galerie Templon, and Item Editions (Paris). * Additional pet fee : 14 euros per night and animal if you book a room (Pets weighing less than 8kg) and 8 euros per night and animal if you book an apartment. The "L'Atelier" restaurant has a terrace with a view over the lake at Divonne les Bains and welcomes you in a delightful setting. It is located very close to Nyon and Rolle, and near Geneva. The restaurant also has a terrace open in summer. The restaurant will be closed for lunch until June 14th 2018. Here on the edge of Divonne les Bains, in this contemporary hotel that stands in a huge park that inspires calm and gentleness, our Chef and his team of cooks, welcomes you and will delight you with his cuisine that varies with the rhythm of the seasons. This recently built hotel near Geneva, beside the lake at Divonne les Bains, has dared to encroach on virgin territory, imagined by the artist Jean-Michel ALBEROLA as a unique location, restrained but daring, where the filtered lights carpet this contemporary lounge and extend the welcoming glow from the central fireplace. You will appreciate the fireside cosy yet trendy atmosphere. Ensconced in one of the smart, brightly coloured leather arm-chairs, you can enjoy tea, champagne and a variety of cocktails, depending on the time of day,. In the evening, there is a subdued atmosphere in the bar, created by a multitude of tall, narrow candles, in striking contrast to the ultra-contemporary decor. The wellness area of the hotel is a magnificent mosaic spa of 500 m2, dedicated to the harmony of your body and your mind: Aquatic pool open on large bay windows overlooking the terrace, park and Mont-Blanc, with hydrotonic course, bubble baths, geysers and Jacuzzi. We invite you to make an appointment directly with the hotel to plan your treatments and massages according to the availability of the masseurs. With Thalgo, live a unique experience to recharge your batteries in a refined setting with free access to the spa while enjoying the region. On 2 nights minimum: 1 Polynesian scrub, 1 lagoon water bath, 1 Polynesian massage, 1 application of scintillating oil. On 2 nights minimum: 1 salty sweet scrub, 1 milk bath, 1 indocéane massage, 1 melting cream wrap. For a minimum of 4 nights: 1 Polynesian scrub, 1 lagoon water bath, 1 Polynesian massage, 1 application of scintillating oil, 1 salty sweet scrub, 1 milk bath, 1 indocéane massage, 1 melting cream wrap. Aquatic area will be closed from Monday 07 January 2018 to Thursday 10 January inclusive (re-opening on Friday 11 January 2018 - 6:00 am) for cleaning and work. Spa area: access to the spa and pool reserved for adults over 16 years of age (special schedule for adults under 16 accompanied by an adult). Care by reservation only. The relaxation pool is heated to 31-33°C and has large windows overlooking the terrace, the park and Mont Blanc. There is an aquatic course, a geyser with a hydrotonic course with massaging spouts and neighbouring jacuzzi. You will be able to access the fitness area which is part of the Spa. It has a running pad that makes it possible to reproduce a natural and effective movement to improve your cardio-vascular system. There is also an elliptic bike on which you have to make elliptical, oval or circular movements and movements of the forearms and back of the arms. A home exercise bike has a position allowing for a moderate or low-intensity workout suitable for beginners. There are also multifunctional exercise machines and dumbbells of different sizes. After physical exercise, visit the steam room with its eucalyptus fragrance, admiring its star-studded dome that will help you see life in all its colours. The sessions take place in the relaxation pool with hot water from 30° to 32°. This moment of relaxation will allow you to ignore gravity. This discipline is ideal for all those who want to combine fitness and pleasure without suffering, in a relaxing setting, with an expert entirely dedicated to your physical happiness. *With extra charge and reservation required. Access to the relaxation pool is reserved for the exclusive use of our residents, hotel and residence. However, our external customers can use our cabins for care. In addition, the Spa's swimming pool is open every day from 7am to 9pm for residents of the hotel and residence. Schedules subject to change without notice. Sunday 9.00 a.m. to 6.00 p.m.
Care (for our external clients and residents) is provided from Monday to Sunday by appointment. We invite you to come 10 minutes before your appointment. Men's and women's locker rooms with shower and individual lockers will allow you to store your personal belongings. Bath towels and bathrobes are at your disposal and must be returned as soon as you leave the spa. 1 night in a comfortable double room. Free access to the SPA: aquatic pool, jacuzzi, hammam, fitness center. Price 215 € per person. The reservation is not cancellable, not changeable and not refundable. Pre-payment at booking. Offer not valid in single room. Rates include all taxes, excluding tourist tax and departmental taxes. Take the height and take your whole family on an adventure in Divonnes-les-bains'"Forestland" park during the summer holidays (July and August)! Forestry trails and many recreational activities are available. La Villa du Lac Residence offers free entrance for children from 2 to 12 years old to the "Splash Pad"aquatic area only during July and August, for any stay of at least one night in half-board. A fun attraction for children and adults to water, wade and challenge the giant bucket of water!! If you like rest and relaxing holidays, discover all our wellness destinations. The town of Divonne and its surrounds are particularly well-equipped with sports facilities. The central position of the Villa du Lac will enable you to explore the region and its cultural treasures which include Geneva and its museums, Martigny (the Gianadda Foundation), Lausanne, Gruyère, Yvoire and Chamonix. You can enjoy the nearby Jura mountains (covering Switzerland and France) to go cross-country or Alpine skiing, ramble in snow-shoes or learn how to manage a dog-sled. The surprising advice in winter! The town of Divonne and its surroundings are particularly well-equipped with sports facilities within a radius of 500 metres around the hotel. These include Pitch & putt and two golf courses, the Hippodrome course (9 holes) and the Domaine de Divonne course (18 holes). ENTRY OFFERED for children under 12 years old at the Splash pad: splash, splash, splash, splash...! Less than 5 minutes away on foot from the Villa du Lac, open from May to September, there is a swimming pool with a shady lawn, a volleyball court and ping-pong. and sailing instruction in July and August. Rambles on the mid-mountain: The Villa du Lac offers you itineraries to discover the Regional Natural Park of the Upper Jura and the Vaudois Natural Park (Switzerland), hiking through the terraced vineyards of Lavaux, one of the most beautiful landscapes in Switzerland. Mountain biking in the Haut-Jura Regional Nature Park. Divonne les Bains, in the Pays de Gex district, is in the north-east of the département of the Ain, with the highest chain of the Jura mountains behind it and the High Jura Nature Park and Switzerland close by. Divonne les Bains benefits from an exceptional and unique setting. The nearby Lake Léman (Lake Geneva) and the great forests of the Jura give Divonne les Bains its very special climate that is both tonic and sedative. There is a magnificent view of Mont-Blanc, nature preserved, a variety of leisure activities and a burgeoning cultural life – all this give Divonne les Bains a gentle symphony of the seasons. Evian and Thonon, the Château de Menthon, the Mer de Glace glacier in Chamonix, and more. 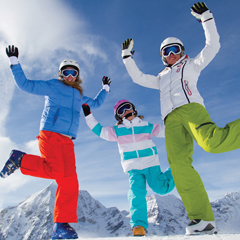 Within a radius of 500 m around the hotel, there are lots of children’s activities for all ages when accompanied by their parents: a sandy beach created at the lakeside, water sports, a pool with water-sledging and more. Vacances Bleues Plus: mini prices for your little ones ! Discover and visit Divonne-Les-Bains, its region and nearby Switzerland! Divonne les Bains is located at the northern end of the département of the Ain, in the district known as the Pays de Gex. It is a spa town very near Switzerland and at the gates of the High Jura Nature Park, offering unique holiday stays. The luxuriant environment of Divonne les Bains includes Mont-Blanc, huge forests and vine yards. Your holidays near Geneva will be an opportunity to see magnificent mountain views but also to discover a totally remarkable heritage. Thanks to its geographical location, your hotel stay in Divonne les Bains will enable you to explore the whole Lake Léman region and its various châteaux, museums and medieval fortresses. In addition to the Divonne Lake and the famous Lac Léman, there are hot springs, waterfalls and rivers, so that water is omnipresent during your holidays in the Ain. Divonne les Bains is famous for its springs and welcomes tourist and those seeking the cure who greatly enjoy a fitness holiday. The hot springs are rich in minerals and trace elements such as calcium, magnesium and fluor, and their beneficial effects and efficacy for body and mind have been proven over time. In 1994, the town received the " thermal and mineral water" accreditation awarded by the Ministry of Health. It is in this grandiose setting, facing the lake and the Jura Mountains that you will find the Villa du Lac for spending a peaceful stay. This hotel in the Ain, consisting of 88 rooms with a balcony will delight you with its contemporary style and elegant decoration. 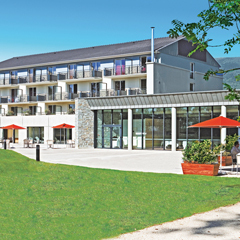 Your hotel stay at the Villa du Lac will enable you to combine relaxation and fitness thanks to the Hotel Spa that offers free access for the hotel guests and those renting the holiday accommodation. The well-being area has a relaxation pool, a steam room, a jacuzzi, bubble baths and many other facilities to enable you to enjoy the various treatments during your spa break at Divonne les Bains. The Villa du Lac hotel also offers free wifi access. The holiday residence is very close to Geneva and benefits from an exceptional environment and a magnificent view of the Alps and Mont Blanc. There is a casino, a golf course and the town centre is close by. The hotel is easily reachable by the A1 Geneva-Lausanne autoroute and it is less than 15 minutes from Geneva; it is also close to the towns of Nyon and Rolle. Divonne: its lake (more than 45 ha with water sports facilities), its casino, its golf course, tennis courts and equestrian centre. In Switzerland: Geneva (15 minutes from the airport), Lausanne, Lake Léman (Lake Geneva). Lélex, summer tobogganing at Col de la Faucille, mountain-biking. Advice on visits and events in the region: the country of Gex, the Chocolate Museum (the Cailler House) in Broc en Gruyère, Yvoire, Nyon... Vehicle recommended for an independent discovery. 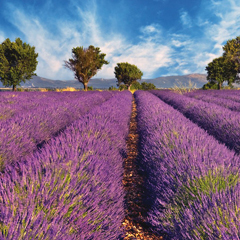 Vacances Bleues is the ideal destination for a holiday at the gates of Geneva, for a stay on the Atlantic Coast at the Villa Caroline or at a residence on the sea front in Provence. Geneva-Lausanne autoroute to the Coppet/Divonne exit. Compulsory paid sticker for the Swiss autoroutes. Geneva airport 15 minutes away. City tax and Départemental tax: rate determined per person and per night, liable to be reviewed in the course of the year depending on municipal regulations. NIGHT + BREAKFAST PACKAGE: Accommodation and breakfast, access to the spa and gym, parking. HALF-BOARD OR BREAKFAST PACKAGE : Accommodation in half-board (breakfast and dinner), access to the spa and gym, parking. RENTAL PACKAGE : Accommodation, TV, bed linen and towels except during fairs and events and end of stay cleaning is included in the fixed price you pay for your holiday. Options : Comfort formula: beds made on arrival, end of stay cleaning, change of the towels in the middle of stay: comfort formula for studio: 12€/night, comfort formula for 2 rooms: 18€/night - Animals: 8€/night. Double room occupied by one person: between 117 and 204€/night depending on the period. 1 entry to the Splash Pad of the Forestland leisure park for children under 12 years old, half board (subject to opening dates). For a minimum of 2 nights: 1 Polynesian scrub, 1 bath Eau des lagons, 1 Polynesian massage, 1 application of scintillating oil. For a minimum of 2 nights: 1 salty sweet scrub, 1 milk bath, 1 indocéane massage, 1 melting cream wrap. RENTAL PACKAGE : Accommodation, TV, bed linen and towels except during fairs and events. Options : End of stay cleaning: 49 to 77€ - Comfort formula: beds made on arrival, end of stay cleaning, change of the towels in the middle of stay: comfort formula for studio: 12€/night, comfort formula for 2 rooms: 18€/night - Animals: 8€/night.